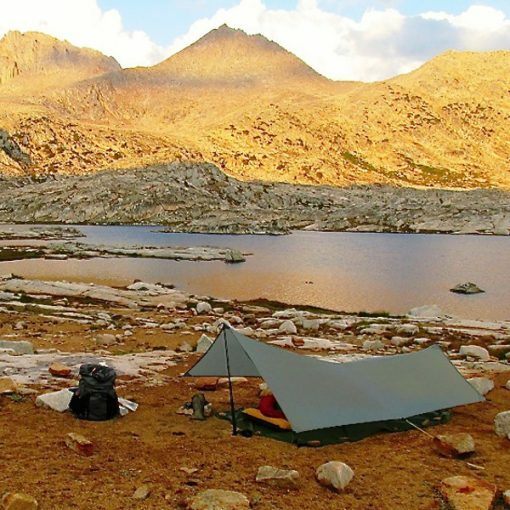 The MLD Grace Tarp is a classic, lightweight “A Frame” tarp that is slightly trapezoidal with a catenary (curved) cut ridgeline, rear, and front ends. This shape pitches quick, and only three side tie-outs are needed for a tight pitch! 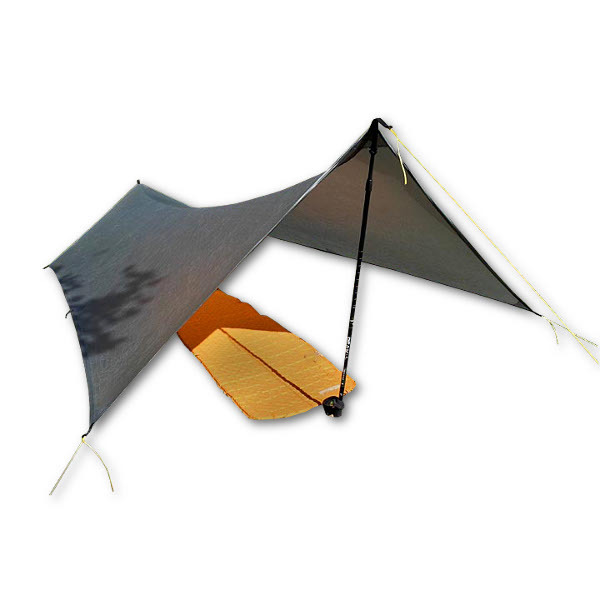 The MLD Grace Tarp is a classic, lightweight “A Frame” tarp that is slightly trapezoidal with a catenary (curved) cut ridgeline, rear and front ends. This shape pitches quick! Only three side tie-outs are needed for a tight pitch! The Grace Tarp is available in two sizes – Solo and Duo – as well as in a range of fabrics, weights, and colors to meet your outdoor (and fashion) needs. About 75% of Solo users prefer the larger Duo Size, especially in heavy rain. • Super strong and extremely waterproof Pro SilNylon material. • 20d Pro SilNylon ridgeline is triple stitched. • Available in the light and very sturdy .75 weight DCF, the .68 CAMO DCF, and the super-light 3-season only .5 DCF. 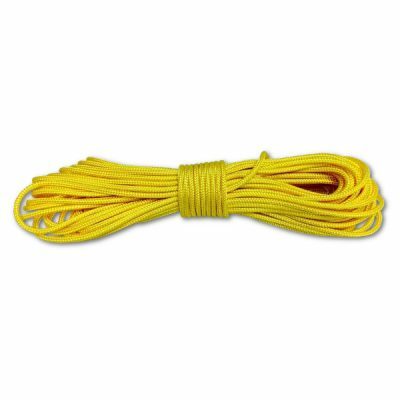 • Eight LineLocks weight only about 1oz total but can be cut off if desired with wire snips leaving a 3/4″ tie-outs loop for the smaller guyline or our 1.5mm mini line. • Properly sized MLD Pro 2.7mm line is included, with an option to upgrade to 2.7mm Pro Reflecto line. Easy to tie/handle with cold wet hands. 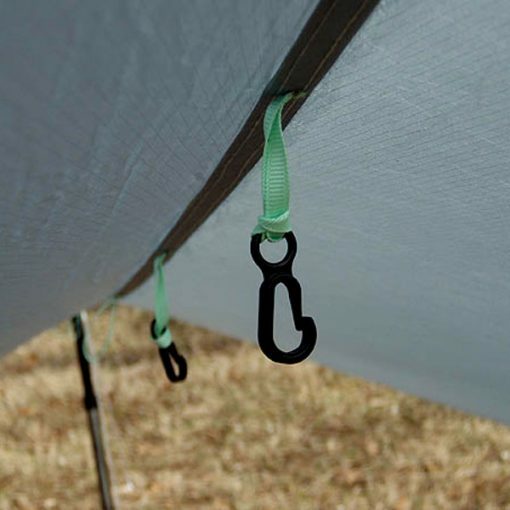 • One mini-clip on the inside ridgeline above the head for hanging a bivy hood, glasses, bug net, bug bivy, sock line, field jerky drying, voodoo dolls, etc. • Ridgeline tieout grommets are sized for our carbon fiber accessory pole locking tips. • 8 Tie-outs: If you’re wondering if you need more tie-outs, You Don’t! 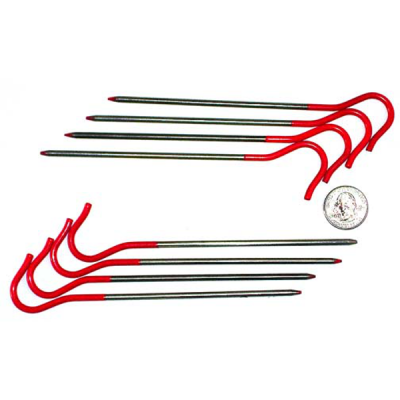 What you may need are bigger stakes- or multiple small stakes- at the corners and the ridgelines for the tightest and strongest pitch! The original cat cut a-frame tarp. I love it! 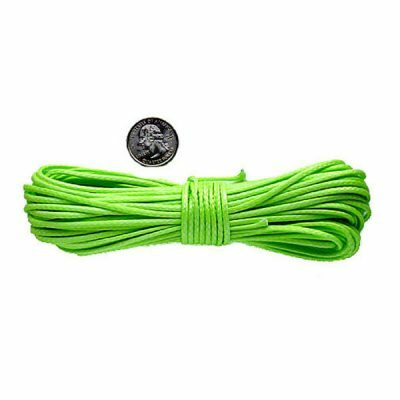 Best quality sil-nylon gear out there. I’ve been playing with this tarp for a week and I love it. I got the .5 cuben version and it is even lighter than the website says. Super easy to get a taut pitch with the cut and bigger than I thought. I left the tarp up in my yard during a Florida thunderstorm and it did wonderful. I would trust this on my next trip. 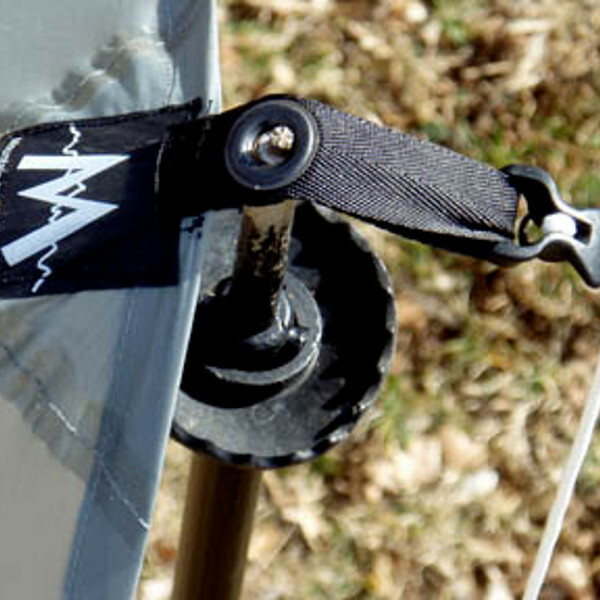 MLD quality is outstanding! One of my favorite pieces of gear. The cut is elegant and very easy to get taut. 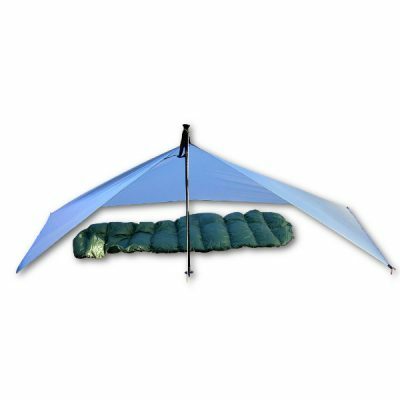 It’s super versatile and you can pitch it in a number of ways depending on your sleeping site conditions. I’ve slept in very windy and wet conditions and it performed beautifully. I received a larger prototype of this tarp in May of 2017. After taping the seams this tarp kept us dry in a full night of moderate rain in little Yosemite valley and during a torrential downpour near Aspen. Very light weight, spacious, and easy to pitch once you get the hang of it. We also used this tarp as a floor sheet for a cowboy camp on the beach, and it performed excellently at this function as well. There were no signs of abrasion or stitching failing despite being laid out over coarse sand and driftwood. Excellent product and great customer service by MLD. Amazing Tarp! I took this to Iceland to hike the Laugavegur/Fimmvörðuháls trail and it performed beautifully in high winds and constant rain. 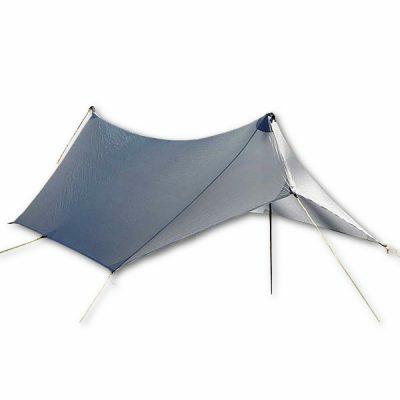 It takes a little bit of practice to set it up properly and you do have to pay attention to the weather and campsite to achieve ideal set up, but I have found it to can be extremely cozy and comfortable, and I now prefer this tarp to any tent I’ve owned. A bought mine 3 years ago. I came back today to see the weight cause I couldn’t remember and lo and behold my photo of this gem is on the featured pics for the website! That’s Vee Lake in September. I am still using the same tarp and I can only say it’s awesome! Rugged yet light. I keep it stored inside my house so that probably helps. Super easy to set up and adjust. A fantastic tarp! I have used my MLD SilNylon Grace Duo easily 250 nights and it’s still going strong. Nice and big. For my record rain and heat filled AT thru-hike I paired it with an inner-net similar to the MLD serenity bugnet shelter and found the shelter to be the best I’ve ever owned in terms of lack of condensation, breathability, and the absolute nicest for hot weather to stay as cool as possible. And I’ve tried a TON (being 6’4″ does drastically limit my choices though). Downsides: not having any protection on the front and rear of your shelter can get a bit wet sometimes, but it’s worth it, even in hot and wet conditions. When it starts getting into the 20s though, things can get maybe too drafty. Fun to set up the tarp for lunch if it’s raining, fun to set up in general once you get used to it.